Everything Dinosaur team members are eagerly expecting the arrival of their shipment of Rebor 1:35 scale Tyrannosaurus rex replicas. The shipment is expected very shortly and in the meantime, staff have been busy making sure that everyone who emailed asking for a model to be reserved has been added to our reservations list. One of the things we have noticed about Rebor is that they tend to assign a moniker or nick-name to their sculpts. For example, the rather wonderful model of Yutyrannus huali was nick-named Y-REX. This term does not have any significance from a palaeontological perspective, after all Yutyrannus, from northern China, lived more than fifty-five million years before the more famous North American tyrannosaurid – Tyrannosaurus rex. Ironically there is a body of evidence to suggest that Late Cretaceous predators such as the members of the Tyrannosauridae that roamed the landmass of Laramidia on the western side of the that shallow sea that divided the continent (Western Interior Seaway), were actually descended from Tyrannosaurs that migrated from Asia. Imagine that, the most famous dinosaur from the United States and the pride of so many North American museum collections being descended from Chinese immigrants. The T. rex is going to be the second replica released in the Rebor model series. It too, is modelled in 1:35 scale, but since Tyrannosaurus rex was larger than Yutyrannus, the replica is considerably bigger. This rather stylish photograph sent to us by our chums at Rebor illustrates this point nicely. Comparing the two 1:35 scale models together. The Rebor Tyrannosaurus rex will have the nick-name KING T-REX. Rebor states that by adopting this tactic, the products can develop personalities and it is the company’s intention to roll out such nick-names across their entire range. Such titles do have other benefits. For example, lots of parents and grandparents contact us and they struggle to pronounce many of the names of the prehistoric animals that they are trying to acquire for their children or grandchildren. An easy to remember (and pronounce) name will certainly prove a boon to those folks who are perhaps not as well acquainted with the tongue twisting names of certain Dinosauria that young dinosaur fans revel in being able to pronounce correctly. Providing regal status for the Rebor Tyrannosaurus rex replica is also appropriate as the binomial scientific name of this Theropod translates as “King of the Tyrant Lizards”. However, this was not the first name used to describe what is now known to be T. rex fossil material. The first Tyrannosaurus rex bones put on the record were a pair of damaged cervical vertebrae (neck bones), one of which has been subsequently lost. Edward Drinker Cope, noting the extensive honey-combed internal structure of these bones assigned the name Manospondylus gigas which means “giant air-filled vertebrae”, not the sort of name to inspire a generation of dinosaur fans. This iconic “King of the Tyrant Lizards”, perhaps the most famous organism known from the fossil record, was also very nearly called Dynamosaurus (D. imperiosus), this translates to “Imperial Power Lizard”, at least the regal theme would have been retained. To read more about the naming of this dinosaur: Tyrannosaurus rex – What’s in a Name? Within natural history museum collections, the Tyrannosaur material can attain a special status. These are the fossils that are requested to be photographed or used in video footage to support a news article. Having Tyrannosaur material is often looked at as being a badge of honour for the museum, whilst in all honesty, other less high profile fossil material within the collection may have far greater significance in terms of importance to research. As arguably, the most iconic of all the dinosaurs, after all T. rex has come out as number one in every single survey conducted by Everything Dinosaur with regards to prehistoric animal popularity, certain more complete specimens have acquired a degree of nobility in the minds of museum directors and administrators. Beautiful 1:35 scale dinosaur model. These “aristocratic” dinosaur fossils have become even more special and important in the minds of the general public as it is these fossil specimens that are the the subject of documentaries and television programmes. As for the question of a “King T. rex“, as in the biggest specimen found to date, or even a new species to distinguish between the different T. rex morphologies known. That is quite hard to answer. “Sue” at the Field Museum in Chicago is regarded as the largest, she (believed to represent a female), is also one of the best preserved and the most complete. But is this the largest Tyrannosaurus rex that ever lived? Probably not, Tyrannosaurs seem to have grown differently to mammals, for as long as they lived they got a little bigger year on year. It is likely that somewhere in the Badlands of Montana or South Dakota there is a fossil of an even bigger T. rex waiting to be discovered. That’s the joy of palaeontology, you just never know. So we look forward to welcoming the Rebor KING T-REX to our inventory, a very noble replica of a Tyrannosaurus rex. Planet Earth might be teetering on the brink of a sixth mass extinction event, climate change resulting in the huge loss of species associated with the Cretaceous mass extinction or the more devastating (in terms of species affected), Permian Great Dying. That is the conclusion reached in a documentary being aired on the Smithsonian channel in the United States tomorrow. The documentary entitled “Mass Extinction: Life at the Brink” explains what scientists now know about the Permian and Cretaceous extinction events, two of the five great extinctions recorded in the fossil record (Phanerozoic extinctions). The documentary also explores how our activities are altering the climate, which could lead to similar collapses within ecosystems. Although global warming is still dismissed by some, most of the scientific community supports the theory that the Earth’s climate is changing and that the planet is getting warmer. One of the key points in the film concerns the issue of if the Earth warms very suddenly, when climate change is examined against the backdrop of geological time, then what would be the consequences? This documentary and a book written by University of California (Berkeley) palaeontologist and professor of integrative biology, Anthony Barnosky (Dodging Extinction) is just one of a series of increasingly alarming accounts of the impact of climate change on our planet, produced by the academic community. Back in 2010, a United Nations report stated that about 30% of all the flora and fauna on Earth was in danger of dying out by the end of the 21st Century due to the rapid industrialisation of parts of the world and the West’s inability to curb greenhouse gases that were potentially leading to dramatic changes in climate. To read more about the United Nations report: Are we Heading for a Sixth Mass Extinction Event? Professor Barnosky and his wife, Dr. Elizabeth Hadley (a biologist/ecologist at Stanford University), appear in the documentary, helping to explain the evidence that has been amassed that suggests climate change is happening and such shifts in Earth’s climate led to mass extinctions in the past. ” I go back to places where I was doing coal exploration geology, beautiful places in western Colorado and now the trees are all dead, mostly from beetle kill because winters have warmed enough so that the beetles can reproduce twice in a season rather than once. In my lifetime, I have seen it go from verdant forests to literally tens of thousands of acres of dead trees, and that’s just in Colorado. There are literally millions of square miles of dead trees up and down the Rocky Mountain chain. All because of greenhouse gases warming the atmosphere”. The table above documents the five mass extinction events from the Phanerozoic Eon (the eon of visible life from approximately 545 million years ago to the present day). The table also provides information about the major animal groups affected. The documentary film’s executive producer is evolutionary biologist Sean B. Carroll, he states that scientists and academics have learned more about what caused the great extinction events of the past. Dramatic events like asteroid impacts and massive volcanic eruptions led to climate change on a global scale wrecking the world’s ecosystems and devastating life on our planet. Also appearing in the documentary programme is Walter Alvarez (University of California, Berkeley), who along with his late father, the physicist Luis Alvarez, first uncovered evidence that an extraterrestrial impact had struck the Earth at around the time of the demise of the dinosaurs. Whilst there has always been extinctions (known as the background rate of extinction), the programme makers warn that as humans reduce the habitat available for other species and alter the composition of the atmosphere, animals and plants are being pushed towards extinction twelve times higher than the background level. Are We Heading for an Extinction Event as Dramatic as the End Cretaceous Extinction? For instance, temperatures may rise by perhaps as high as four degrees Celsius by the end of the 21st Century, a rise almost as great as during the end Permian extinction event, which resulted in the loss of some 95% of all life on Earth. It has been suggested that most of the coral reefs may vanish by the year 2070, as the oceans become more acidic due to increased levels of carbon dioxide in the atmosphere. This could result in the loss of 25% of the fish species in the sea that depend on coral reefs resulting in the loss of 10% of the ocean’s fisheries with direct implications for the human population. In addition, the authors and the documentary makers urge people to lobby political and business leaders to help bring about fundamental changes in the way that we as a species perceive the natural world and its resources. It has happened before and we are certain that it will happen again. A scientist examining the fossilised remains of dinosaurs within the collection of a museum, finds that on analysis, specimens ascribed to known genera, turn out to be new species. Dr. Nick Longrich from the Biology and Biochemistry department of the University of Bath was studying Ceratopsian (horned dinosaur) specimens at the Canadian Museum of Nature (Ottawa, Canada) and thanks to his research, two horned dinosaur fossils, known from the Dinosaur Provincial Park Formation of Alberta and previously believed to represent Anchiceratops and Chasmosaurus may actually represent animals new to science. 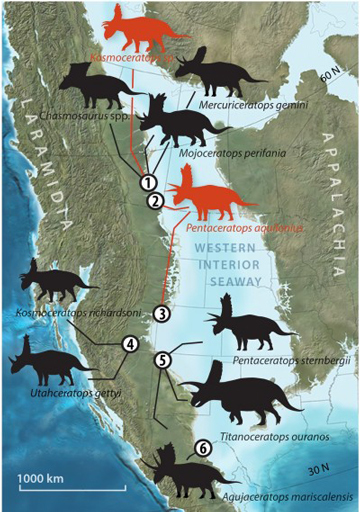 Writing in the scientific journal “Cretaceous Research”, Dr. Longrich proposes that the fossils he studied, although from Canada, resemble dinosaurs known from much further south, from New Mexico and Utah to be precise. How could this be? Let’s start with by looking at the landmass we now know as North America and what it looked like some seventy-five million years ago in the Late Cretaceous. In the Late Cretaceous, rising sea levels and tectonic forces led to the formation of an immense shallow sea that covered much of the continent. This sea, which effectively linked the Arctic Ocean with the Gulf of Mexico, is known as the Western Interior Seaway. The extent of the seaway changed over millions of years, shaping the landmasses and also influencing the flora and fauna that lived on them. Towards the very end of the Cretaceous further plate movements and a phase of resulting mountain building led to the shrinking of the sea, the seaway retreated shrinking to represent a marine environment less than 10% of its maximum area by the beginning of the Cenozoic. The picture above shows how the shape of the continent is believed to have changed over the last ten million years or so of the Cretaceous Period, now back to Dr. Longrich. The landmass that existed on the western side of this seaway is known as Laramidia. Dinosaurs dominated this part of the world, just as they did in all the other terrestrial environments during the Cretaceous, but the fossil record preserved indicates that there was a tremendous variety of dinosaurs in this part of the world. What is more, there seems to have been distinct faunal provinces, the southern portion of this landmass had different dinosaurs to those found on the northern parts of Laramidia. The fossil record seems to show ethnicity in the fauna that evolved, how and why this occurred (even if it actually occurred at all), has been hotly debated by palaeontologists. Some scientists have suggested that there must have been physical barriers between populations that over tens of thousands of years permitted new, distinct species to evolve. A new species of “northern Pentaceratops”. Pentaceratops aquilonius may have been very closely related to the southern Pentaceratops (P. sternbergii), but it was smaller and it had differently shaped frill bones and a different arrangement of hornlets (epiparietals). The genus name means “five horned face”, although, just like the much later and more famous Triceratops, this dinosaur only had three horns. The elongated jugal bones on the side of the skull had horny outgrowths, when viewed from the front, this dinosaur had the appearance of having five horns. The species name aquilonius means “northern” – a reference to where this dinosaur roamed. The second horned dinosaur fossil specimens, studied by Dr. Longrich had been thought to represent Chasmosaurus. However, the British palaeontologist noted that the partial skull in the Canadian Museum of Nature’s collection closely resembled another type of horned dinosaur called Kosmoceratops. Fossils of Kosmoceratops have been found in Utah, (Grand Staircase-Escalante National Monument), this horned dinosaur was named and described back in 2010. Phylogenetic analysis of the skull’s characteristics places this specimen in a sister taxon to Kosmoceratops richardsoni, the name ascribed to the Utah fossil finds. More fossils are required from the Dinosaur Provincial Park Formation before a new species of Kosmoceratops can be erected. A mixing of faunas, at least amongst elements of the Ceratopsidae. The diagram above maps the two dinosaurs (coloured red) in situ with other Chasmosaurine dinosaur fossil discoveries. Dinosaurs would spread from one part of the continent to another and then diverge from their “home” ancestors to evolve into a new species. Competition between the different species then would have prevented the dinosaurs from moving between the northern and southern provinces, although changes in climate and flora may too have had an affect. The established populations may have been able to resist migrations as they had specifically evolved to cope with local conditions. These patterns of distribution might help explain why palaeontologists keep finding more types of dinosaur, when they sample different habitats, they find different species. “In this sense, dinosaur biology seems quite different from mammal biology. It could be that mammals are more intelligent and so they tend to have more flexible behaviour, they adapt their behaviour to their habitats. On the other hand, dinosaurs may have had to adapt themselves physically to survive in a different habitat and as a result, they evolved into new species. Perhaps that’s the reason why there are so many species. The Ceratopsian fauna of Laramidia has posed a number of important questions for palaeontologists. For example, in Alberta bone beds of Centrosaurine dinosaurs (one group of Ceratopsians) are relatively common, a number of bone bed deposits have been found, whereas fossils of Chasmosaurines (the other group of Ceratopsians) are much rarer altogether and very little bone bed evidence has been discovered. We said at the beginning of this article that there had been previous cases of a new species of dinosaur being discovered when museum collections are re-examined, to read about a similar case, but this time involving the Sauropoda, see the link below. Year 3 at Hurst Green Primary have been studying rocks, fossils and dinosaurs in the second half of the autumn term. 3H have even been split into five teams for this topic that explores dinosaurs and life in the past. The teams are Tyrannosaurus rex, Velociraptors, Sabre-Tooth Tigers, Mastodons, and Pterodactyls. Our dinosaur and fossil expert, praised the teaching team for their innovative approach to delivering the learning objectives for this topic, however, it was pointed out that there were one or two concerns over the names chosen for the teams. For example, although “Sabre-Tooth Tiger” is a term in common usage, the cats within the genus Smilodon are not closely related to modern tigers. Teams in the classroom learning about dinosaurs. We did point out the other errors in the team names and sent over information to help the teacher make the corrections. In addition, we gave the class one of our “pinkie palaeontologist challenges”! In collaboration with the teacher, we challenged the children to create a scientific poster of the prehistoric animal that their team name was based on. We promised to email over some teaching resources all about these prehistoric animals. Could the children create a display all about T. rex, Mastodons, Velociraptors etc. To set up the task, we explained how scientists display results and data on poster boards. We asked the children to create scale drawings, diagrams of the animal that their team was named after (with proper labelling of course). Could they explain what the animal ate, where it lived and how long ago these animals roamed the Earth? A teacher lists the extension ideas during a dinosaur workshop. The posters would provide an example of a non-chronological report. This activity would help the children recount what they had learned during the Key Stage 2 dinosaur workshop and it would link nicely in with teaching objectives related to English, Maths, History and Geography elements of the national curriculum. Our dinosaur expert spent the morning helping Year 3 study dinosaurs and fossils. With a focus on ICT, could the children’s posters be pinned onto a classroom wall and a picture taken of them? This photograph could then be emailed to Everything Dinosaur, all part of helping the children to learn about how emails and websites work. First it was the Jurassic World trailer (officially released by Universal Pictures last night), now even more exciting prehistoric animal related news for fans of top quality dinosaur replicas. Everything Dinosaur will be stocking the Rebor 1:35 scale Tyrannosaurus rex replica. We are expecting to get our first shipments sometime before 10th of December*. A beautiful model of Tyrannosaurus rex. This is the second model to be released by Rebor, the first being the very popular Yutyrannus huali (beautiful feathered tyrant). This too, is a very beautiful figure, with lots of amazing detail and once again Rebor have been careful to get lots of anatomical details correct with one or two distinguishing flourishes of their own – hence the row of scutes running along the back to the base of the tail. Replica has articulated lower jaw. Here’s the really important information, Everything Dinosaur are model collectors too, we don’t believe that our customers should have to pre-order. After all, this model has not even started shipping out of the factory yet, so we don’t think it is fair to ask customers to pay for something when it is not in our warehouse. So, to register your interest, simply email Everything Dinosaur: Contact Us and we will reserve a model for you and there’s no obligation to purchase. When stock arrives one of our team members will email you in person, confirm the price of this new, highly collectible replica and then offer you the opportunity to buy. That’s it, no hassle, no pre-ordering, no worries. This particular replica has been named “King T. rex), an appropriate moniker for the “King of the Tyrant Lizards”. Our dedicated team members will do all they can to reserve a replica for you, but we warned, we think these dinosaurs are going to sell out quicker than tickets to a “Jurassic World” premier. December 10th* the stock is expected on all around this date (estimated delivery into warehouse), however, please be aware that at this time of year, shipping dates can change and this can affect the expected delivery date of goods into the Everything Dinosaur warehouse. Such delays do happen, we at Everything Dinosaur think it’s another reason for not having to pre-order an item. Please note, Everything Dinosaur will do all it can to reserve a model and keep dinosaur fans and model collectors updated on stocks and availability, but we can’t hold products for months and months – please try to be fair to us. Rest assured, as our thousands of customers already know, we are an honest company and replica collectors ourselves and we will do all we can to assist you. A “must have” for serious dinosaur model collectors. So it has finally arrived, Universal Pictures have released the official trailer for Jurassic World, the fourth movie in the JP franchise. We had been aware of the plot details for some time, now we can see the trailer. When this film is released (June 12th 2015), it will be 22 years since the first Jurassic Park hit the screens – gosh, we are excited. Remember, the Park opens June 2015. We at Everything Dinosaur can’t wait although the marine reptile looks a little oversized. Perhaps it has been genetically altered, not the only thing on Isla Nublar to have been genetically modified? A South Korean news agency has reported that the nearly complete fossilised skeleton of a new species of meat-eating dinosaur has been discovered in Hadong county, some 300 miles south of the country’s capital Seoul. A think tank, the National Research Institute of Cultural Heritage has stated that not only is this the most complete dinosaur skeleton to be found in South Korea it is also the smallest. The specimen represents an individual animal that would probably have been around 30 centimetres in length, with a good portion of that being made up of the tail. The miniature meat-eater’s skull measures 5.7 centimetres long and is 2.6 centimetres wide. Palaeontologists have yet to determine whether the fossil is of a young dinosaur or an adult animal. Tiny fossils from South Korea. The picture above shows the partially exposed skeleton, elements from the skull as well as the ribs and part of the back bone can be made out. From the photograph, it is difficult to determine what sort of creature this could be, it does not look particularly Theropod like with this dorsal view (view from the top looking down) of the specimen. A number of dinosaur and other prehistoric animal fossils have been found in the Early Cretaceous rocks that are exposed in Hadong county (South Gyeongsang province). This fossil has been tentatively dated to around 120 million years ago (Aptian faunal stage of the Early Cretaceous). Sauropod tracks are also known from this part of the world, as well as fragmentary evidence supporting the presence of large, carnivorous dinosaurs including some remarkable bones that might have preserved evidence of dinosaur feeding behaviour. To read about the discovery of dinosaur bones that might provide evidence of feeding: Strange Marks in the Bones – Dinosaurs Feeding? Back in 2008, the South Korean Government failed in their attempt to get part of the coastline of the country, with its rich and varied Mesozoic fossils, listed as a UNESCO World Heritage site. Intriguingly, notes accompanying the press release stated that the tiny fossil had vertebrae connected to the ribs, whether this statement means that the ribs were actually fused to the backbone is unclear. It has also been suggested that another specimen is located in the same matrix. We at Everything Dinosaur, will look out for further press releases, hopefully more information about this discovery will come to light. Could the Fossils Represent a New Species of Tiny Theropod Dinosaur? Many small meat-eating dinosaurs once roamed ancient environments. For the Reception class at St Joseph’s R.C. Primary, the question posed this term was “which was the biggest dinosaur”? The budding palaeontologists had been busy exploring prehistoric animals aided by their enthusiastic teaching team. 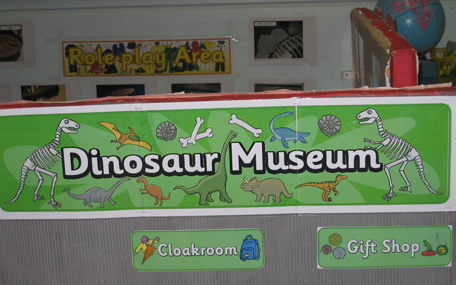 Mrs Crean had helped the children to build a dinosaur museum in the classroom. Inside the museum, there were lots of examples of words used to describe different types of dinosaur and other animals that lived in the past. The museum even had a gift shop and a cloakroom, a place for palaeontologists who visit the school to store their hard hats! The teaching team for the EYFS (Early Years Foundation Stage) are following a very creative curriculum and the children were very confident and enjoyed handling the fossils and learning just how big some dinosaurs could be. The dinosaur workshop enabled the children to experience what it would be like to be an Ankylosaurus moving through the forest, or an Ammonite in its shell bobbing up and down in the sea. During the teaching session the children were encouraged to use describing words and to explore the properties of materials. A fossil tooth feels very cold to the touch, some fossils can be small and light, whilst others can be very heavy. Our thanks to Miss Harrison for helping when it came to carrying the specimens. Miss Tucker made sure that everyone was given the opportunity to take part and Mrs Barnes helped organise the children into a group photograph to mark Everything Dinosaur’s visit. Perhaps the photograph will be put up in the museum? Encouraging the use of describing words. As for what was the biggest dinosaur, our dinosaur expert emailed over some information on the dinosaur that is currently regarded as the biggest scientifically described – Argentinosaurus. It is always a pleasure to receive drawings of prehistoric animals from fans of dinosaurs. We get lots and lots sent into our offices from all over the world. We are always pleased to receive these illustrations and it amazes us how diverse the drawings are. Dinosaurs dominate, but we get pictures of Ichthyosaurs, Pterosaurs as well as artwork depicting scenes from the Palaeozoic as well as the Mesozoic. In addition, our post bags and emails also contain drawings of prehistoric mammals, Woolly Mammoths and Sabre-Toothed Cats being particularly popular. Here are some examples sent in to Everything Dinosaur from India. A colourful dinosaur drawing from India. The illustrator has correctly stated that the name Giganotosaurus means “giant southern lizard”. We have printed out this artwork and pinned it onto one of our warehouse walls, so that everyone in the company can see when they are in the warehouse looking for dinosaur toys and games. Another interesting drawing, one depicting a fight between two dinosaurs. The green, long-necked dinosaur reminds us of the “Rearing Diplodocus” model in the Collecta not-to-scale model range. Model was introduced in 2013. We really enjoy viewing all the wonderful prehistoric animal drawings that get sent into our offices, the one below shows an illustration of the huge, fish-eating dinosaur known as Spinosaurus, (thanks for this Shivesh). When it comes to the dinosaurs, we tend to get a lot of pictures showing carnivorous dinosaurs, including the likes of Allosaurus and Tyrannosaurus rex. We have posted up a wonderful drawing of a meat-eating dinosaur, this time coloured predominately sky blue. The dinosaur in the picture above seems to be on the prowl, perhaps it is stalking potential prey. We at Everything Dinosaur really enjoy seeing all these wonderful prehistoric animal illustrations. Our thanks to all the budding, young (and not so young), palaeoartists that take the time and trouble to send them into us.